If you’re a blogger or website manager, SEO is something that should always be at the top of your mind. Organic search traffic is, in my opinion, the holy grail of internet marketing. Theoretically, you can write content until the cows come home, but if you don’t rank well in the major search engines, you’re unlikely to receive a lot of value from that content in the long run. If you can rank on the first page for a varied set of keywords, however, just the opposite is true. You’ll be able to write a piece of content once and reap the rewards of that content for years to come. The question is: what can you do to make sure your content ranks well? A lot of things, but in this post I’m going to focus on social media and SEO. If you don’t know what the means, don’t worry about it, it’s basically just an industry term to mean posts, likes, shares, follows, etc on various social media sites. Social signals from Facebook, for instance, might be someone liking your website’s facebook page, sharing a blog post, or liking a post that someone else shared. 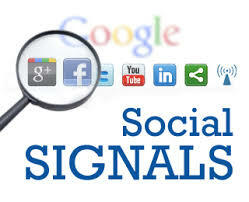 Social signals = total activity across all social media websites. Learn more about social signals on Moz.com. We’ve known for years that Google has been tracking this data. Matt Cutts, the official face of the Google search algorithm, told everyone as much back in 2012. Then, he seemed to back off the statement in 2013. Now we’re in 2016, and these indicators are more important than ever. Basically, search engines, among other things, try to evaluate how trustworthy a website is, and whether or not it provides content that, in general, people want to see. It’s not a hard leap to make, then, that content that people actively share and respond to on social media represents content that they’re interested in, or, at the very least, engaged with. In other words, social media is an indicator of trust. Leaving aside the minority attempts to buy likes, etc, people only share or like what they trust, so a lot of activity means your website must be interesting, which means it deserves to rank well.